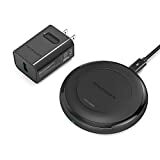 It might have seemed crazy when the RAVPower HyperAir Fast Wireless Charger first launched at $49.99, but thousands of BGR Deals readers bought one anyway and we got tons of great feedback via email. Why? Because this charger is truly a cut above the rest. Instead of cheap plastic, it’s made of aluminum with a rubber ring on top to keep phones from sliding around. It also ships with a fast charging wall adapter and a high-end braided power cable, which cheap chargers don’t ship with any wall adapter at all. It was definitely worth every penny at $49.99, but now the price has dropped on Amazon to $29.99. And if you use the coupon code ZSNPQ9HJ in the next two days, you’ll only pay $19.99!